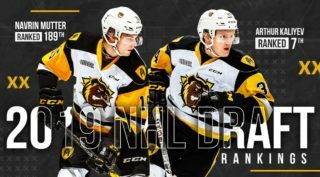 The Hamilton Bulldogs were looking to continue a couple of great draft years by doing it again on Saturday during the 2018 OHL Priority Selection. The Bulldogs used their 1st round pick to select Logan Morrison of the Guelph Gryphon Minor Midgets 18th overall. Morrison, a 5’9, 144 lb C/RW put up 86-points (38 goals-48 assists) in 36-games this past season. With their first of two picks in the 2nd round, Hamilton took Michael Renwick (34th overall) from the Mississauga Reps Minor Midgets. Renwick, a 5’11, 168 lb defenseman had 24-points (6 goals-18 assists) in 33 games this past season. 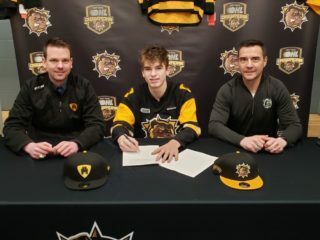 With their second pick in the 2nd round, the Bulldogs took Davis Young (37th overall) from the Mississauga Reps Minor Midgets. Young, a 5’10, 175 lb center had 42-points (13-29) in 33 games this past season. Hamilton had no picks in Rounds 3 or 4 but used the 95th pick overall in the 5th Round to take goalie Marco Costantini from the Vaughn Kings Minor Midgets. At the 2018 OHL Cup, Costantini was 5-1, had a 1.83 GAA and a .930 SV%. With a second pick in the 5th Round (98th overall), the Bulldogs selected Frank Jenkins from the Detroit Honey Baked 15’s. the 6’1, 202 lb defenseman recorded 46 penalty minutes in 19 games this past season. In Round 6, the Bulldogs made George Diaco the 101st pick overall. The 5’5, 161 lb center from the London Jr. Knights Minor Midgets had 23-29=52-points in 33 games this past season. 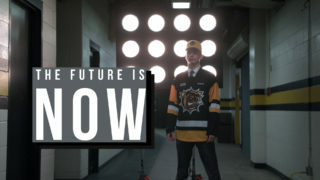 The Bulldogs had a second pick in the 6th Round and took Avery Hayes (118th overall) from the Detroit Honey Baked U16. The 5’8, 144 lb C/RW put up 22-23=45-points in 50 games. Patrick Schmiedlin was Hamilton’s 7th Round pick (138th overall). The 5’11, 160 lb center from Culver Academy Prep, had 9-15=24-points in 38 games. In the 8th Round (158th overall), the Bulldogs selected Robert Strachan from the Don Mills Flyers. The 6’3, 168 lb center recorded 9-10=19-points in 63-games. With the first of two picks in the 9th Round, the Bulldogs chose Rylee Hlusiak (167th overall) from the Barrie Jr Colts). The 5’9, 179 lb RW had 17-20=37-points in 33 games. Andrew Britton (178th overall) from the Guelph Gryphons Minior Midgets was taken next. The 5’11, 155 lb LW had 19-25=44-points in 36 games. In the 10th Round (198th overall), Hamilton selected RW Cole O’Hara from the Toronto Jr. Canadiens. At 5’8, 140 lb, O’Hara had 3-4=7-points at the 2018 OHL Cup. The next pick in the 11th Round (218th overall) for the Bulldogs was 5’11, 155 lb LW Ryan Brown from the Oakville Rangers. Last season he had 12-20=32-points in 28 games. Ryan Tverberg was the Bulldogs pick in the 12th Round (229th overall). The 5’6, 145 lb center from the Toronto Jr. Canadiens had 1-5=6-points in the 2018 OHL Cup. In the 13th Round (258th overall), Hamilton selected Nicholas Sova from the Oakland Jr. Grizzlies 15’s. The 5’11, 161 lb defenseman had 2-5=7-points in 19 games. The Bulldogs went local with their pick in the 14th round by taking Mark Duarte from the Hamilton Huskies 278th overall. The 5’11, 149 lb center had 9-7=16-points in 33 games. With their 17th and final pick, the Bulldogs selected Matteo Costantini in the 15th Round (298th overall). The 5’8, 153 lb center from the Niagara North Stars had 12-15=27-points in 32 games. 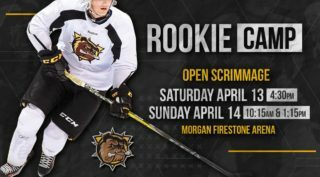 The class of 2018 rookies will hit the ice in the Bulldogs Rookie Evaluation Camp following the 2018 OHL playoffs.